And why I believe in being a proliferator of good energy. 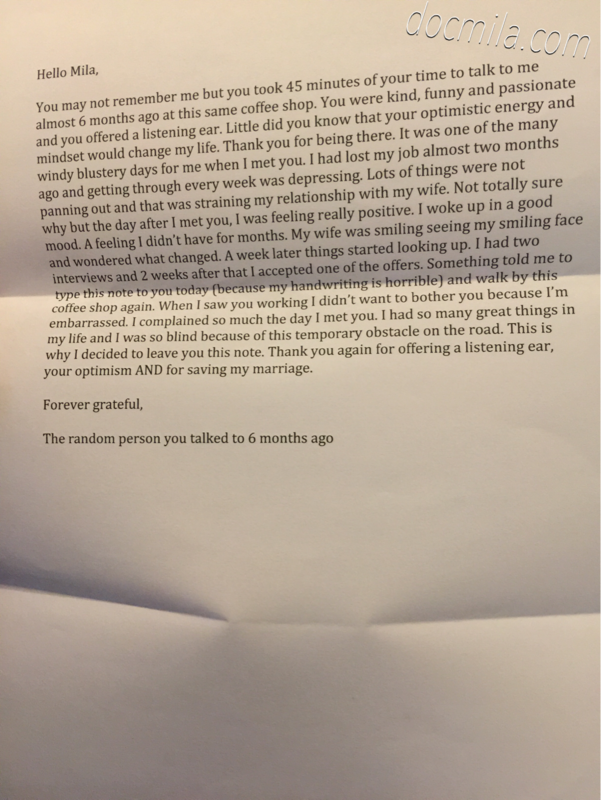 I was speechless for a couple of hours after this letter was left on my laptop a little over two weeks ago. I am forever humbled and touched. Dave, I wish for you to come back to this coffee shop. To talk to me in-person again and to bring your wife with you and not just leave a note on my laptop while I go to the restroom. I do remember you. Very vividly. I wish to see you again, to hear about your growth and success, and to meet your patient and loving wife. I am sending my gratefulness for this sweet letter to you and to the world to see, in hopes to open everyone up to themselves. Too often people don’t realize how many of them go through life so wrapped up in their own lives that they don’t see the people and the world that surrounds them. Life has taught me to never touch anything with half of my heart and I encourage others to do the same. I’m grateful that our paths crossed and that you’re happy and well. Thank you for touching my heart and for proliferating endless smiles to me and to the world. I encourage you to be a proliferator of good energy, to be a light for someone else, to give love, to communicate, to listen to others, to collaborate with them and support them. We are in this world to help one another. All of us grow faster when we Master The Blank Page™ and support each other.